So Friday started a blitz of 5 music events in a 36-hour period. I got my work done and headed to Boulder Friday afternoon for a Legitimate Front rehearsal. We have a few different band members this time, but mostly getting the tunes working again was straightforward. I then went and bouldered at The Spot in the downtime after the rehearsal. After that I checked in at the Biergarten and helped our snare drummer Ian set up some equipment for our live recording. When things we ready, we hit the bar to eat some sausages and drink large beers before the gig. We played at 10pm with 2 songs outside first then marching into the stage in the back room. For the second set, Eric Keeney from The Afronauts was there with some cameras to shoot a live music video for us. By then the place was packed and the crowd was enthusiastic so with any luck we will get some great footage out of it. After tearing down gear and heading home with Tony my old bandmate from Confunktion Junction in tow (more on that in a moment), I slept 2am-7:30am. Then it was back at it to get to Denver for a last-minute rehearsal. Gora Gora Orkestar had booked a well-paid gig for a corporate publicity event in Denver, but we had a substitute sousaphone player and needed to get her up to speed on a few more songs. So I drove to Alice's house, cooked up some bacon, and we had a quick rehearsal. It was also the Denver Tour de Fat that day so one of Raissa's friends was there in a honey bee costume when I arrived. After rehearsal and breakfast of bacon, bagels, lox, and OJ, we headed to the gig. It was a weird thing where they had hired us to be ostensibly a marching band, a cheerleading squad, and a hip-hop dance group to each go out onto the sidewalk in front of a giant protein shake set piece and perform briefly at the top of each hour between noon and 4 PM. So it was a lot of waiting around and not much playing, but it will help cover our airfare to Boston for HonkFest next month, so it was a no-brainer to book it. I left there after our 3rd round of performances to get to Boulder in time to sound check at The Boulder Theater with Legitimate Front. It's the largest non-CU venue in Boulder so I was excited to perform there. It's fun having a sizable venue staff handing the sound system and generally buzzing around connecting stuff. After sound check I caught a much-needed nap in the green room and waited for Tony to arrive to meet me for dinner at Aji. I had a delicious steak fritter appetizer thing and Feijoada and Tony had moqueca. Then I headed in to get ready to perform. The event was a fundraiser party thrown by the Cooley LP law firm and the Entrepreneurs Foundation of Colorado called "The Entrerprenuer's Prom". Three rock bands specializing in different decades were on the bill. Legitimate Front had the middle slot and it was a good set. A bunch of gown-glad ladies rushed the stage to dance to "Stayin' Alive" and Jason nearly re-busted his hip jumping around with his guitar while he's still recovering from very recent hip surgery. My housemate Jeff was there with some friends and we danced a bit afterward while I had a beer and some cake. Then it was home to collapse in sleep. Backing up to Wednesday night, Tony from Confunktion Junction arrived late at night for a visit. Thursday we worked from home in the morning, then he went to north Boulder on my road bike to visit a bike shop there. We met in Boulder for dinner at The Kitchen followed by drinks at The Bitter Bar, then a ride home with the bike crammed into the back of my Insight. Friday Tony came to the GGO show. Saturday he went both to Fort Collins to visit a bike shop and then to Tour de Fat in Denver then back to Boulder to meet me for dinner at Aji. The past couple weeks have been mostly normal routine for me. I went to Tour de Fat Fort Collins with Jasmine at the end of August, which was a lot of fun. 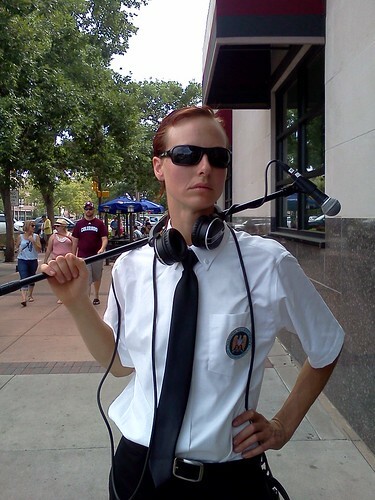 We dressed as NSA goons in FBI-type attire, carried boom microphones around, and staying in character hovering around people creeping them out, which I really enjoyed. Also Reggie Watts performed and he's great. Today I just relaxed, caught up on a dozen emails that have been neglected for weeks and weeks and took it easy (2 servings of gelato so far, as well as Aji leftovers).